From a strictly financial viewpoint, the Debt Snowball doesn’t make sense. You target the smallest balances first and gradually move on to the larger ones, regardless of the interest rates on each debt. However, as I am learning from personal experience, paying down debt is often more of an emotional process. If you can harness your emotions to drive you to pay down the debt faster, a debt snowball may make perfect sense. My husband and I accrued quite a bit of debt the last several years, mainly because we lived on a very small income (averaging $30,000 a year while living in the suburbs of a major city with a high cost of living while raising 3 children). Our income was small because I was just beginning to work as a freelancer and my husband was finishing his Ph.D. Now, we are in a much better financial position, and we are tackling our debt with the goal of having it all paid off in the next year or two. We started with three credit card balances and four student loans between the two of us. Our plan was to pay down the credit cards first, and then move on to the student loan debt. However, that plan has recently changed. We have one credit card paid off, and the second credit card now has a balance of only a few hundred dollars. The third credit card has a whopping $11k balance. We have one behemoth of a student loan with a $17k balance and then three smaller ones at $4k, $5k, and $5.5k. Our plan is now to pay off the smaller student loans first. Many people would urge us not to deviate from our plan and to instead work on the $11k credit card balance because it has the highest interest rate (nearly 5% higher than our student loan interest rate). They would also say that the interest on the student loans is tax deductible, which is another reason why we should save it for last. Finally, they would argue that we would end up paying more in interest overall because we waited to pay off the higher interest credit card. These are all good arguments with a solid financial basis. They were in fact what I was thinking when I planned our modified debt snowball to knock out all of the credit card debt. However, I found that when I could see the end in sight, I worked that much harder to pay it off. At the beginning of this month, the smaller credit card had a balance of $1,100. Because I could see that the balance was almost gone, I set about to pay it off this month. I put any extra money I earned or received on that card. I started selling more things around the house. I did what I could to free myself of that balance. If the balance would have been $11k, I wouldn’t have had the same drive because even though I would be paying it down, the end would be no where in sight. If I instead move to the smallest student loan once this small credit card is paid off, I am still motivated because I know it may only take a few months to pay off the $4k student loan. My plan is not based on sound financial principles. It is based on my emotions and my drive. For me, that is what will help me pay off the debt more quickly. You may be different. If you get motivated by how much you will be saving in interest, you may want to pay down debt based on highest interest rate first. If you had debt to pay off (or are doing so know), which method did you use to pay it down? We didn’t have as much credit card debt when we started (only about $5,000) so my plan was to wipe the credit card first. I also wiped the car loan. We have about $21,000 left spread out over seven student loans and I am definitely paying those based off amount rather than interest (they are all pretty much the same interest rate, give or take a point or two). While I would choose to pay off the credit card debt first, whatever works for YOU is the best option in my opinion. People operate differently and as long as you’re still working to pay it off, that’s fine in my book. I think it depends a lot on what type of person you are. If you are logical the debt snowball may not be the best for you but if you are more emotional I definitely see how the snowball can help. It makes sense – we send “emotionally” – because “I want!!! !” – so why not use the same emotions to keep you motivated on the way to Debt Free status? My challenge was that I only had the one debt Â£10,000. So mentally I split it up to 1000 payments of Â£10 and every time I paid off ten pounds I would do a little boogie around my kitchen….. but same principle, it got me getting creative to find the next Â£10 and the next and the next – until finally I was looking at finding the LAST Â£10. Boy did that feel great!! Keep going hon – you know it is all going to be worth it. Emotions can get in the way of our financial well-being, but they can also be the catalyst for positive financial change. You know better than anyone what will motivate you and push you to reach your goals. If paying off the smaller student loans gets you to your goal faster- then there’s no doubt- DO IT! 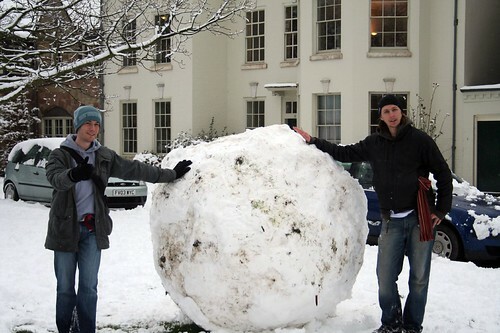 My husband and I have stuck with a traditional debt snowball. We have found it very rewarding to see progress, and now almost the finish line. We have the debt snowball posted on our fridge for everyone to see. Especially our children 🙂 We have paid off $41,415.83 since August 2011. And we plan to be debt free before 2013, except our home. It’s a great feeling and so worth it! Previous post: Why Are You Taking Out Student Loans?